Greek Latin: Nycticeius - "belonging to the night." Latin: humeralis - "pertaining to the humerus." Fur: Dark brown to blackish, paler below; hair - blackish base, dark brown tip. Tail membrane: Blackish; sparsely haired to hairless. Wing membrane: Blackish; sparsely haired to hairless. Ears: Short (12 mm); hairless; rounded tip. Tragus: Clearly less than one-half ear length; rounded tip; curved forward. Total length: 93-105 mm. Forearm: 33-39 mm. Wingspan: 260-280 mm. Total weight: 7-14 g.
Dental formula: 30 total; I 1/3, C 1/1, P 1/2, M 3/3. Other: Upper incisors separated from canines. All species of Myotis: Tragus straight and nearly or more than one-half ear length; two upper incisors. 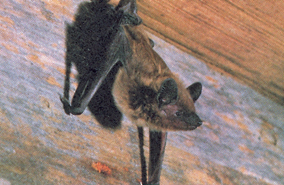 Big brown bat (E. fuscus): Larger size (>10 g) and longer forearm (>40 mm). Overall: Southeastern United States to extreme north-eastern Mexico; north to latitude of central Iowa and west to longitude of eastern Nebraska and Kansas. Iowa: Females found in southern two-thirds of Iowa in summer. Adult female evening bats migrate into southern Iowa by mid-May to establish nursery colonies of 25 to 500+ individuals in both woodland and human-made structures. 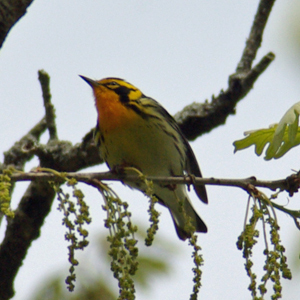 Few adult males have been reported from the northern part of their range and none from Iowa. Since sexes segregate in summer, little is known about either mating or the general reproductive cycle of this bat. While up to four embryos have been reported, females from Iowa usually carry two. 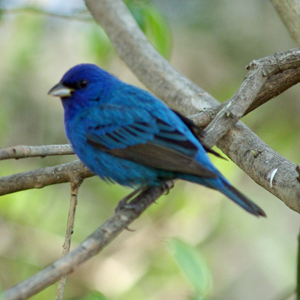 Most young are born in early June and begin to fly by early July. The evening bat often emerges early in the evening, frequently feeding with other species along water courses, forest edges, and in canopy openings. This species feeds primarily on beetles, moths, and leafhopppers. 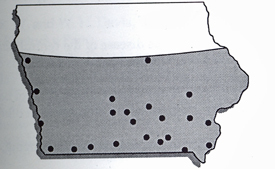 Recent studies in the state suggest that the evening bat is an important component of the bat fauna of southern Iowa forests but is absent or rare in northern counties. In woodland sites, small nursery colonies are established in hollow branches and cavities, as well as under loose bark. Newly volant young and post-lactating females utilize several alternate roosts by early July" (Bowles et al. in press). Evening bats, as well as other forest dwelling colonial species, may need a critical number of roost trees to sustain viable populations.